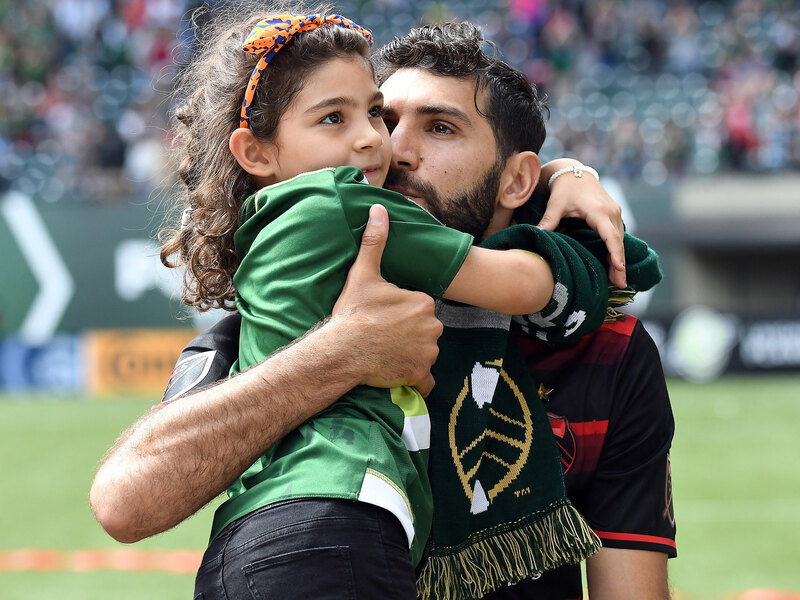 Diego Valeri has found a home for himself in Portland, where he has thrived on and off the field after coming to the USA from Argentina. WASHINGTON—Reminded that Guillermo Barros Schelotto is a legend in Columbus, that Christian Gómez is remembered fondly here in the nation’s capital and that Federico Higuaín (with the Crew) and Javier Morales (at Real Salt Lake) are still going strong in two of Major League Soccer’s smallest markets, Portland Timbers star Diego Valeri nodded with certainty and was as quick with an explanation as he is in identifying the pass that will best dissect a defense. Valeri, a 30-year-old attacking midfielder with a wife and 7-year-old daughter, hails from Lanús, an industrial city/suburb south of Buenos Aires. He loves his hometown yet called it “one of the most dangerous places in the world.” In a country of contradictions, both are possible. He spent 10 years at his eponymous local club and won a Primera División title in 2007. Valeri speaks with reverence about the hold and influence soccer has over his country but laments the current state of the game. From the administrative scandals to this week’s Olympic elimination, “It’s really sad what is happening now,” he said. Argentina produces great players but it also limits them. Valeri stays in touch and remains closely connected. But he doesn’t miss it. He needed the quiet for his family and his football. The victim of a terrifying armed robbery in the fall of 2012, Valeri joined the Timbers the following spring and now is settled in a country and city where he’s found peace. No soccer player can disappear entirely in Portland, but the quality of life is more than satisfactory. The balance is there, and the focus and energy he’s been able to shift toward the field has made all the difference. He’s a two-time member of the league’s Best XI, has more assists than any MLS player since 2013 and last December, he helped lead the Timbers to their first title in four decades. Valeri already has 10 goals (11 is his MLS high) and five helpers this season and on Wednesday, the club announced a contract extension that will keep Valeri in “ponderosa green” through at least 2019. That’s because in Portland, he feels embraced rather than vulnerable. Valeri acknowledged Friday that the Timbers (8-8-8) still feel a bit of the MLS Cup afterglow and are living in “the best moment in history of this club.” But striving for more—he mentioned the CONCACAF Champions League without prompting—now is part of the team’s DNA. One championship has whet the appetite for more. And he seems troubled by the thought of disappointing fans who’ve been so generous with their support. After all, he’s practically one of them. He takes his daughter, Constanza, to Thorns NWSL games when he can. Prior to last month’s Cascadia Cup showdown with the Seattle Sounders, Valeri and Constanza joined the Timbers Army for some tifo painting. Father and daughter finished out the championship star on Freddy Krueger’s “jersey.” Valeri then scored twice in a 3-1 triumph. It helps that they’ve had had lots for which to cheer. There was the disappointment of failing to qualify for the 2014 playoffs, and Valeri himself suffered an ACL tear at the end of that campaign. But before and after, there’s been joy. Portland was a first-place finisher and Western Conference finalist in ’13 (its third MLS season) and Valeri has reached the 10-goal plateau in three of his four years with the club. No one will accuse him of being a full-field force—he's a true enganche even though he wears No. 8 instead of the playmaker’s 10—but Valeri is so smart and technically gifted that he finds to change games in a variety of ways and from a variety of formations. He adapted and blossomed when coach Caleb Porter nudged Darlington Nagbe inside and shifted to a 4-3-3 last year. Now Valeri typically wreaks havoc from behind the striker in a 4-2-3-1. He has just the right amount of Argentine garra—look no further than his stunning opener in December’s MLS Cup final—and there’s technique to spare. Last weekend’s volley against Sporting Kansas City, or any other number of spectacular goals, attest to that. Only a few hours left to vote. Still, he wasn’t chosen to represent the league in last month’s MLS All-Star game, and he hasn’t played for his country since 2011. The Timbers’ resonance belies its status as a team in the country’s 24th-largest media market. Maybe if he played in a “bigger” city or in a “bigger” league, he’d garner greater recognition. He understands the tradeoff. But he made it clear this week when committing to Portland that the Rose City is where the recognition matters most. Valeri said he’s now around “half-way” between Argentine and American—he was thrilled with his visit to the White House on Thursday—and that he’s excited by the prospect of being a “two-club” man. He has Lanús and the Timbers. He still cheers for the former and was thrilled when it claimed the Primera title in May. And he’s far from done with the latter.